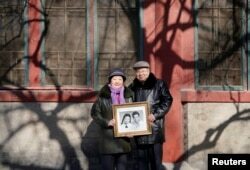 Huang Fusheng, right, 83, and his wife, Tang Lanfang, 80, pose with their wedding photo, taken in 1958, at Prince Fu Mansion built during Qing dynasty, where they worked together from 1965 to 1992, in central Beijing, China, Feb. 7, 2018. 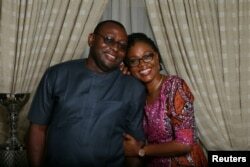 Oladipupo Baruwa, 45, an investment promotion officer, and Funke Baruwa, 43, a gender and development expert, pose for a photograph at home in Abuja, Nigeria, Feb. 9, 2018. 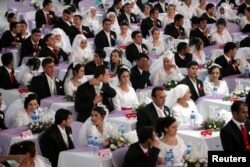 Brides and bridegrooms wait for the start of their wedding ceremony in Ankara, August 6, 2006. 6. คุณอยากมีลูกไหม? – คำถามสำคัญสำหรับชีวิตคู่ คือ ทายาทสืบสกุล บางครั้งอาจมาจากแรงกดดันของครอบครัว บางครั้งอาจมาจากความต้องการของตัวเอง ซึ่งคุณและคนรักต้องคุยกันให้ชัดเจน ลงรายละเอียดไปไม่ใช่แค่อยากมีหรือไม่อยากมี แต่ต้องถามต่อไปว่า ถ้าอยากมี จะมีกี่คน?และจะมีลูกเมื่อไหร่? Noor Djait, 31, an architect, and Ismail Benmiled, 36, a businessman, pose for a photograph with their three-year-old son Said and four-month-old daughter Malek at their house in Tunis, Tunisia, Feb. 9, 2018. Brides display their hands decorated with henna around a bride as she poses for her own photographer during a mass marriage ceremony in which, according to its organizers, 70 Muslim couples took their wedding vows, in Ahmedabad, India, February 11, 2018.